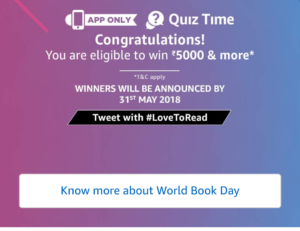 1 How to win Rs 5000 from Amazon World Book Quiz? 2.1 Q1) What did the monk in Robin Sharma’s book sell? 2.3 Q2) In the book ‘The Chamber of Secrets’ who is James Potter’s son? 2.7 Q4) Which of these is the title of the first book in Amish’s Shiva trilogy? Amazon is back with a new Quiz, and we added all the answers of Amazon Book Quiz. In this quiz, 12 winners will get Rs 5000 just by answers 5 simple questions. World Book Day is a celebration! It’s a celebration of authors, illustrators, books and it’s a celebration of reading. In fact, it’s the biggest celebration of its kind, designated by UNESCO as a worldwide celebration of books and reading, and marked in over 100 countries all over the world. So, just check this post to get detailed information on Amazon World Book Day Quiz Answers. Just answer 5 simple questions to get a chance to win Rs 5000 Book Quiz. This quiz will remain live until 23rd May 2018. You have to go to the bottom of the Amazon App Home page to enter this quiz. We also added Amazon World Quiz Winners List, you can check that from the below mentioned link. 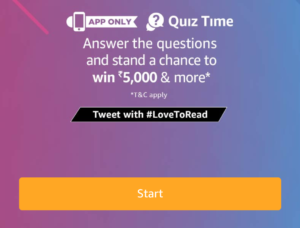 How to win Rs 5000 from Amazon World Book Quiz? 2. 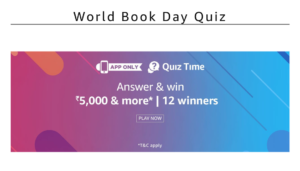 Open the app and you will see a banner about the World Book Day Quiz Time contest. Click on it. 3. Now click on the ‘Start’ button to begin the Amazon World Book quiz. 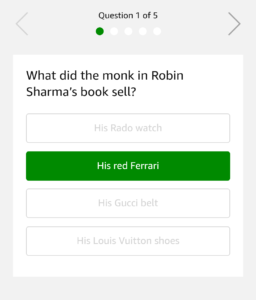 Q1) What did the monk in Robin Sharma’s book sell? Q2) In the book ‘The Chamber of Secrets’ who is James Potter’s son? Q4) Which of these is the title of the first book in Amish’s Shiva trilogy? 5. After answering all 5 questions correctly. That’s it. Just wait for the Winners list of Book Quiz. 1. This Contest will commence on 23rd April from 12:00:01 a.m. (IST) to 23rd May 11:59:00 p.m.
5. The draw of lots will be carried out during the Contest Period for the questions and a total of 12 (Twelve) participants will be selected as winners by a random draw of lots. A total of 12 (Twelve) participants will be selected as winners of the Contest. 6. The first 6 declared winner(s) will be eligible for winning Rs.5000 and a Kindle and Next 6 winners will get Rs.5000 (hereinafter referred to as “Prize(s)”).